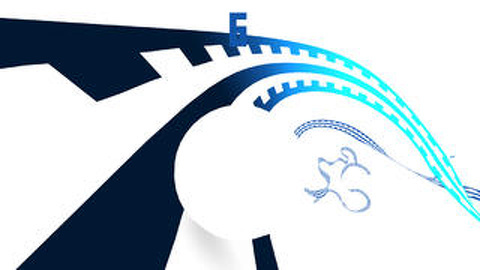 If you are ready for a challenging, exciting iOS game app, try to navigate the twists, turns, and convoluted loops of the Impossible Road iPhone, iPod Touch, and iPad app. Two gestures and two colors for the graphics make it seem simple, but it is a complex, rich, and sometimes maddening experience. 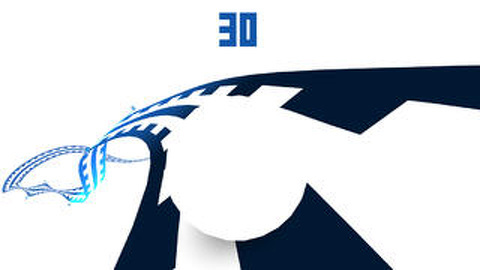 The Impossible Road iPhone app has a white background with rich, royal blue graphics. It automatically syncs with Game Center, as noted by the welcome banner and icon in the upper right corner of the screen. Immediately left of the Game Center icon is a headphones icon. You turn the cool music on and off with a touch. The game starts immediately with a white ball that reminds you of a ping pong ball on a royal blue highway. This highway is filled with twists, turns, and loops creating a circuitous game course. You try to keep the white ball on the course, or, if it falls, steer it back on to a loop. The goal is to pass the jumps to collect points. The game play seems straightforward, but it is crazy difficult. It is, however, the kind of crazy difficult that keeps you coming back for more. The challenge of the game is not the winding and looping course, but the delicate touch of the two gesture controls required to create success. The gesture controls require precise taps on the left and right sides of the screen to turn right and left. If you hold your finger too long, you will veer off course. If your tap is too light, then you will fall off course on the opposite side. Gestures with Impossible Road style games incorporate device tilts and well-coordinated taps, but using only taps makes it much more difficult. As you fall, you can try to tap your way back on the road. If you make it back on a road, it is tough to sustain your forward progress because you have to immediately respond to a change in the course. Most likely, you will watch the elusive course below your ball as it fades into oblivion. The Impossible Road iPhone, iPod Touch, and iPad app is ridiculously addictive, despite the frustrations and failures. It is well worth the $1.99 download from the iTunes App Store for a fresh take on a classic gaming experience. AppSafari review of IMPOSSIBLE ROAD was written by Jenni Ward on December 11th, 2013 and categorized under Action, Adventure, App Store, Arcade, Fun, Games, iPad apps, Universal. Page viewed 13189 times, 8 so far today. Need help on using these apps? Please read the Help Page. is ok. interesting review . thanks. Great review,afiliado very good congratulations !! I found it interesting, facebook ads para afiliados great place, loved !! Very good, thank you for the chance formula negocio online thanks and good luck to all! Thanks for the article, I was behind that information on the internet and had not found. Thank you so. Thank you, if you want to know a little mine is this one. Thank you a lot to share this kind of information with us. You know, another day I was looking exactly about information like you shared. Thank you! That´s the point that I was finding! You´re great! I´m reccommending this site to my friends! I loved your article, congratulations! I found the chart simple and a bit difficult, but in general it’s a good application! anyone knows if there is app for http://www.prontaparaconquista.com ? Coll… This is the best bro! parabens pelo app, show de bola!